....... a night in Hanoi, half a day to explore the city and an orientation session before an overnight train journey. Once you’ve arrived and settled in, we’ll provide you with some light but informative entertainment. On the following day, we’ll show you the sights of Hanoi and take you to the Ethnology Museum to prepare you for your excursion up into the mountains. In the evening, we’ll meet you over dinner to say ‘hello’, and talk about your tour. Around 21.30, you’ll board the overnight sleeper to Lao Cai on the border with China. The train arrives in Lao Cai at a decidedly uncongenial time of 05.00, but breakfast and a shower will fortify you for a drive to a market in a remote area. Then it’ll be back to Lao Cai and on up into the mountains to Sa Pa. As you’ll probably be suffering from the effects of getting up in the dark, we put you in a hotel for the night. 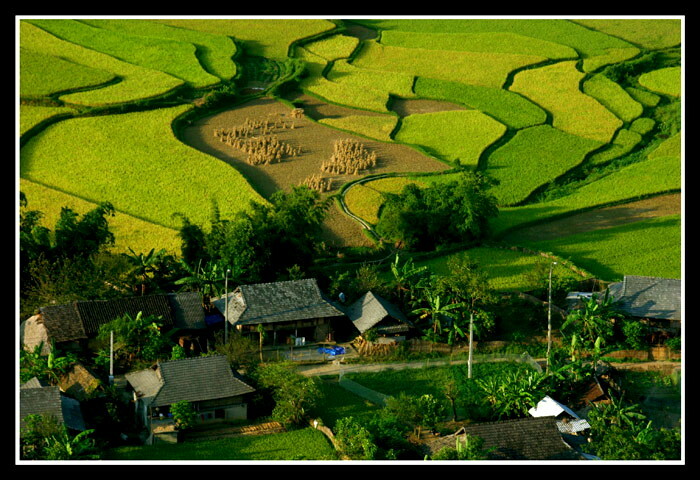 At a more civilised hour, you set off to visit some of the many ethnic villages in the area. How you travel is mainly up to you. Hardy souls will probably want to trek, but other options are gentler hiking routes, bicycle, the back of a motorbike, jeep or, for the ‘softies and proud of it’, an air-conditioned car. Of course, the more comfortable modes of travel limit your range. You’ll sleep in local houses, usually communally in a large room. If there’s no other travellers booked in, you’ll probably have the place to yourselves, as some the house owners prefer a separate room. Another early morning, unfortunately, but your hotel room will be ready for you for a rest and breakfast, and you have time to do some souvenir shopping before your car arrives to take you to the airport. Travel in an appropriate private air-conditioned vehicle and/or a Jeep with an experienced safe driver.